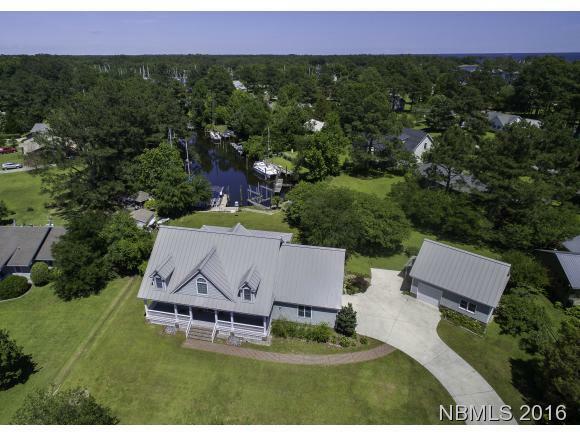 Exquisite craftsmanship with a flawless design make this 4 bedroom, 3 full-bath, 2 half-bath waterfront home in the Heart of Oriental an exciting opportunity! Built on the highest waterfront lot in the Village, there has never been any flood waters near this home or out-buildings! Custom amenities include a metal roof, hardiboard siding, vaulted tongue-in-groove 18' ceilings w/ gas-log fireplace in living room, Italian tile flooring, geothermal heat pump, 400 amp service. Carolina room, sewing room, office, zoned HVAC, attached 2-car garage, detached workshop, 7,000 lb boat lift (2 slips). No HOA! Not in a flood zone!